The 2nd Japan-Africa Business Forum was held in Tokyo on 25-26 July 2017 on the theme ‘Investment and Business Opportunities with Africa’. The Forum was organized by the Bank’s Asia External Representation Office and African Diplomatic Corps (ADC) in Tokyo, in collaboration with Japan International Cooperation Agency (JICA), Japan External Trade Organization (JETRO) and United Nations Industrial Development Organization (UNIDO). The Forum brought together AfDB Senior Staff, African Ministers, Japanese Government Officials, and Private sector from both Japan and Africa to discuss economic developments in Africa, focusing on business opportunities, and Africa’s development through business promotion. About 1,500 participants, including 400 viewers through live stream in Africa and Japan, participated in the forum, which also provided knowledge sharing and networking opportunities. AfDB Senior Vice President, Charles Boamah, led the Bank’s delegation which included Jennifer Blanke, Vice President for Agriculture, Human and Social Development, and Amadou Hott, Vice President for Power, Energy, Climate Change and Green Growth. They attended series of encounters organized by the Japanese ministries of Finance, Foreign Affairs, Economy, Trade and Industry, as well as JICA, JETRO, United Nations University, and University of Sophia, among others. The central theme of the Forum, ‘Investment and Business Opportunities with Africa’ is aligned with the Bank’s High 5 priorities (Light up and power Africa, Feed Africa, Industrialize Africa, Integrate Africa, and Improve the quality of life for the people of Africa). Each session focused on one element of the High 5 agenda, which the panelists discussed in relation to their sector. The Forum has two main objectives: to provide business stakeholders from Japan and Africa with new business ideas and opportunities; and to increase the number of matching opportunities between them to encourage Japanese companies to commit themselves to doing business and actively investing in Africa. 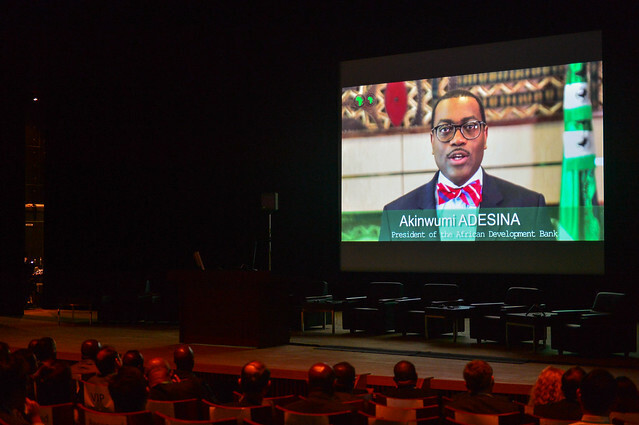 In a special video message aired during the Opening Session on July 25, AfDB President Akinwumi Adesina stressed the close relationship between the Bank and Japan, which is one of the strongest and most reliable Bank supporter, partner and stakeholder. “We wish to boost private sector-led growth in Africa and thus take a logical approach to attracting the enormous investments that we need to make to accelerate Africa's development,” Adesina said. The first Forum was held in June 2014, one year after the Fifth Tokyo International Conference on African Development (TICAD V) with the goal of contributing to further enhancement of the business partnerships between Japan and Africa. At TICAD V, Japan and African countries in attendance identified the "promotion of private sector-led economic growth" as a priority agenda item and recognized the important role of Japan in contributing to the growth and development of Africa through business activities. TICAD VI was held for the first time in Africa in Nairobi, Kenya, in August 2016. Japan pledged US $30 billion public and private support for Africa over the next three years to boost infrastructure development in the continent. It attracted a high level of interest among Japanese business executives. There were great expectations toward accelerating the promotion of private sector-led economic growth, a key agenda identified at TICAD V (2013). In this context, the timing to host the Second Forum in 2017, one year after TICAD VI, was considered appropriate to maintain and further boost high level interest within the Japanese community. During the Forum, 118 business matchings between Japanese and African companies were held successfully, 90 companies in total participated. There was one success story – Burkina Faso’s ZIL Telecom and the Japanese Lequio Power Technology Corporation signed a Sales and Distribution contract for West Africa during the meeting.